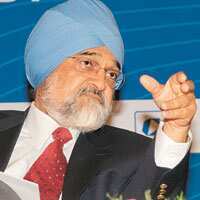 Government stamp: Planning Commission deputy chairman Montek Singh Ahluwalia. Drivers, electricians, paramedics, midwives, cooks and beauty parlour workers might soon be able to get government recognized certificates after they finish courses at private institutions and then take a standardized test. To create 70 million new jobs in the 11th Plan (2007-12), the Planning Commission has recommended a public private partnership (PPP) model to enable skill development through short-term vocational courses, which may range from six months to a year. “According to the Planning Commission’s proposal, students who acquire a certificate from private institutions can go in for a national test organized by the government and, once they clear the national test, they will get a certificate, which will enhance their job prospects," said Planning Commission deputy chairman Montek Singh Ahluwalia. Ahluwalia also said that in order to encourage private institutions to start such courses and churn out talent, the Commission has proposed that the government will give a certain amount, say Rs5,000 per student, to the institution for everyone who successfully completes the test. This initiative is a part of National Skill Development Mission being created in the 11th Plan with a proposed outlay of Rs31,200 crore. The government plans to extend training facilities to 10 million people a month, up from 2.5 million a year. The Mission will oversee and facilitate the entire process of collaborative action. The government imparts vocational training through 8,000 centres, such as the Industrial Training Institutions (ITIs) and polytechnics across the nation. Some policy experts in India often say that, by comparison, there are 200,000 such institutions in China. The Commission has earmarked 10 areas in manufacturing and another 10 in services where such a skill development programmes can work. The 11th Plan also envisages existing public sector infrastructure, available through ITIs and polytechnics, moving to a PPP model even as industry associations and companies are encouraged to create new sectoral skill development plans. According to Ahluwalia, the PPP business will be monitored by a committee set up by the Mission which will have senior officials of all key ministries as its members and will be headed by a chief executive officer. “Private sector should play and important role in the certification business," says Amir Ullah Khan, economist with India Development Foundation, an independent research outfit that has done work in skill development. “While the government should facilitate skill development in backward regions and rural areas, in the cities the private sector can do that job in a better way." He cites NIIT Ltd as one such example of private sector playing a large role.